The new penal code is now in force despite parliament delaying its enforcement to July 16, the state human rights watchdog and prominent lawyers have contended . A provision for postponing implementation of the new penal code was included in an amendment bill passed on April 12, a day before the new law was due to come into force. The new penal code was ratified on April 13, 2014 with a one-year period for preparation. The bill changed the date of enforcement from April 13 this year to July 16. The provision for postponement was therefore inconsequential as it has not become law, the Human Rights Commission of Maldives (HRCM) and lawyers Maumoon Hameed and Shaheen Hameed argued. The HRCM wrote to the attorney general and prosecutor general last week seeking clarification of the legal dispute, saying it is unclear which criminal law the police, prosecutors, and courts are presently following. The commission said it was “extremely concerned” about resulting human rights violations in the investigative and judicial processes. 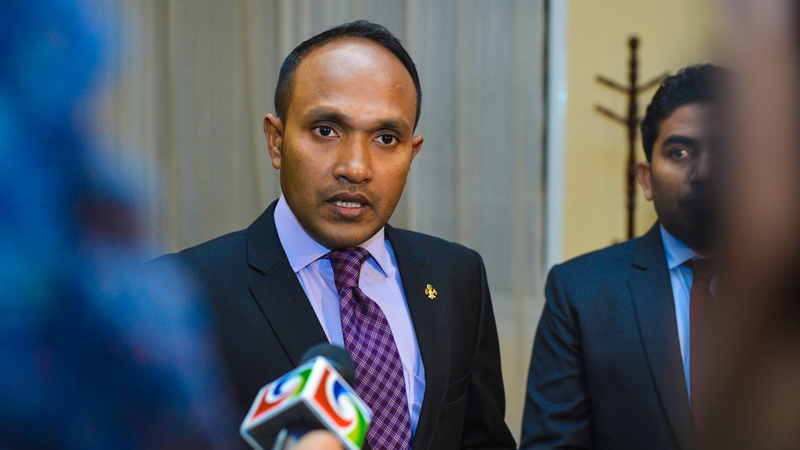 Prosecutor general Muhthaz Muhsin told Minivan News that “as a common rule the old penal code would be in force now”. “I cannot say anything specifically about the issue until the office has responded to the HRCM’s letter. Also, it is not my role to criticise laws but rather uphold it,” he said. Former Chief Justice Ahmed Faiz meanwhile dismissed the legal questions surrounding the penal code as an unjustifiably narrow approach in interpreting the law. “The amendment will also become part of the law. So the penal code now states the date it would come in to effect. We cannot simply single out one article and interpret the whole law. I think it’s quite clear,” he told Minivan News. 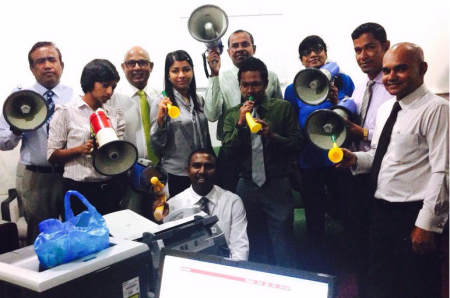 However, lawyers Maumoon Hameed and Shaheen Hameed insisted that the new penal code has replaced the old law. There are presently no obstacles to enforcing the new penal code, Maumoon Hameed told Minivan News today. “The new penal code states the old law would be dissolved when the latter law comes into effect. So I believe that the state is implementing a law that does not exist,” Hameed said. Shaheen Hameed, former deputy speaker of parliament, also said he believes “the new penal code is in effect now”. The current penal code was adopted in the 1960s and has been widely criticised as outdated, draconian and unsuited to the 2008 constitution. Under the new code, the punishment for protesters who do not have a criminal record will be less severe as judges are required to take mitigating factors into consideration under new sentencing procedures. However, the ruling party said more time was needed to raise public awareness and address concerns of religious scholars. The government has barred ex-president Mohamed Nasheed from the Maldivian Democratic Party he co-founded by using its parliamentary majority to pass a law banning prisoners from political party membership. Nasheed will lose his leadership and membership of the MDP because of a terrorism conviction this month relating to the detention of a judge during his period in power. He was jailed for 13 years after being found guilty of terrorism in a case that his party says represented a politically-led campaign against him by the government of President Abdulla Yameen. 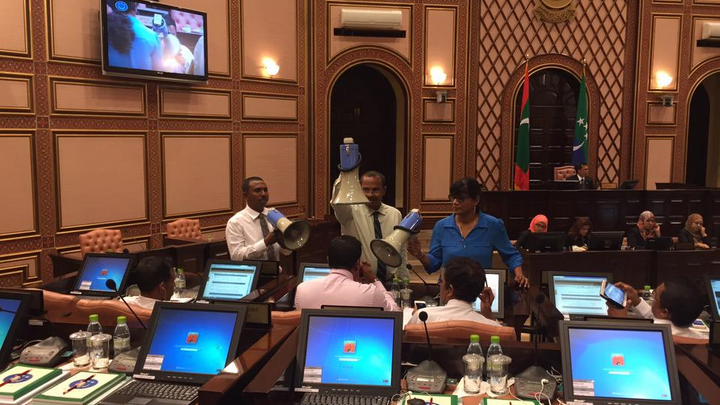 MDP MPs did not take part in the vote, but protested on the Majlis floor as deputy Speaker ‘Reeko’ Moosa Manik announced the vote, using megaphones and sirens to make his voice inaudible. 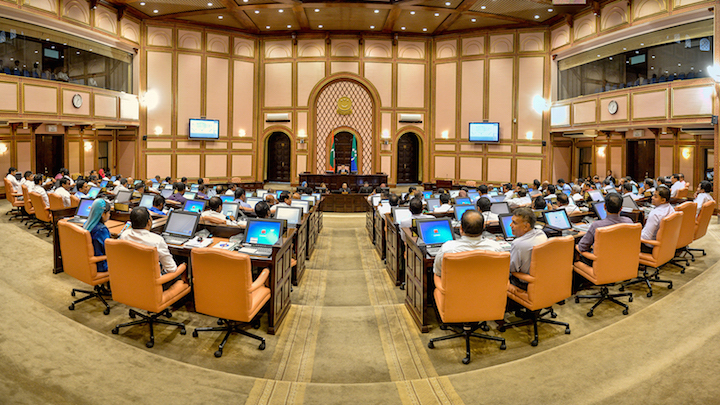 The ruling Progressive Party of the Maldives has a strong majority in any case. The law was passed by 42 votes in favour, with just two against. Speaking to the press, MDP chairperson Ali Waheed said the party would not accept the amendment and would choose its own leader. Nasheed remains the MDP’s presidential candidate, the party has said, despite his jail sentence. “The government, because they have absolute power, is trying to wipe out all political rivals. Note this, they will eventually try to disband the MDP. But how can they get rid of what is in our hearts?” Waheed said. “No amount of backtracking can strip him of the fact he formed the first political party in the country and became its first democratically elected leader. Or the fact that those who vote for this amendment today would not be in a political party if not for the hard work of this man to win them that freedom,” she told Minivan News. Eva said the Majlis was being conducted unconstitutionally as standing orders prohibit sittings from going ahead without order on the floor. The MDP has been protesting on the floor at every sitting since March 2, and has said it will not stop until the government releases Nasheed. The bill was never debated in parliament due to opposition protests, while PPM MPs were not responding to calls at the time of going to press. The two MPs who voted against the amendment to the 2013 Prisons and Parole Act are Adhaalath Party MP Anara Naeem and Nolhivaram MP Hussein Areef, who recently resigned from the PPM. The Adhaalath Party this month withdrew support for President Yameen’s administration, saying he was acting to eliminate political rivals, and instead formed an alliance with the MDP. The amendment also bars prisoners from holding membership or leadership in non-governmental organizations for the duration of their prison term. Separately, the ruling PPM has also submitted an amendment to the law on privileges for former presidents stripping any president who resigned – as Nasheed did, although he said it was under duress – from army protection and financial privileges. 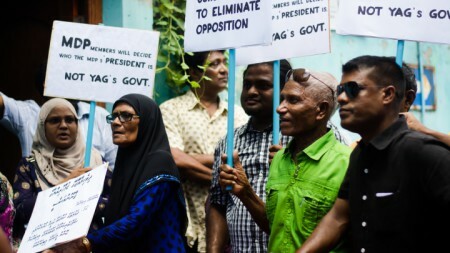 Tensions are high in Malé, with the opposition’s daily protests now entering their seventh consecutive week. The police last week threatened to crackdown on protesters, claiming they were inciting violence and assaulting police officers. 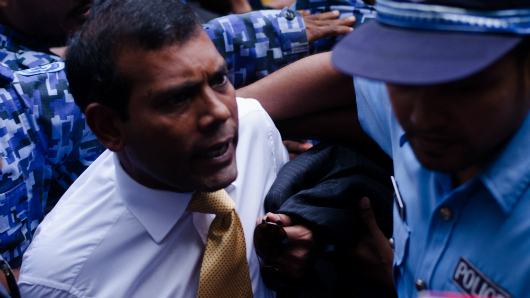 Observers including the UN and Amnesty International have condemned Nasheed’s trial. Amnesty called it a travesty of justice, while the UN said it made a mockery of the constitution and international treaties. President Abdulla Yameen should formally apologise for his thumbs down gesture at opposition MPs during today’s opening of the People’s Majlis, opposition Maldivian Democratic Party (MDP) Chairperson Ali Waheed has said. At a press conference this afternoon, Waheed contended that the gesture was intended to “mock” the opposition alliance, adding that it would not be acceptable to the public. “I do not believe what we saw today should have been the message given to the people after delivering an address by a head of state,” said MDP parliamentary group leader, Ibrahim ‘Ibu’ Mohamed Solih. After delivering his presidential address today amidst chants from opposition MPs calling for the release of former President Mohamed Nasheed, President Yameen gave two thumbs up to pro-government MPs and made a thumbs down gesture towards MDP and Jumhooree Party (JP) MPs. President’s Office Spokesperson Ibrahim Muaz Ali has since defended the gesture, tweeting that it was “an advisory gesture” against obstructing constitutionally mandated duties. “Today we saw [opposition MPs] attempting to obstruct the president’s from fulfilling his responsibility under Article 84 of [the constitution],”he tweeted. Opposition MPs gathered in front of the secretariat desk carrying posters depicting police manhandling and dragging the opposition leader into court and called for Yameen’s resignation. Nasheed was arrested last week and remains in police custody pending the outcome of a trial on charges of terrorism. 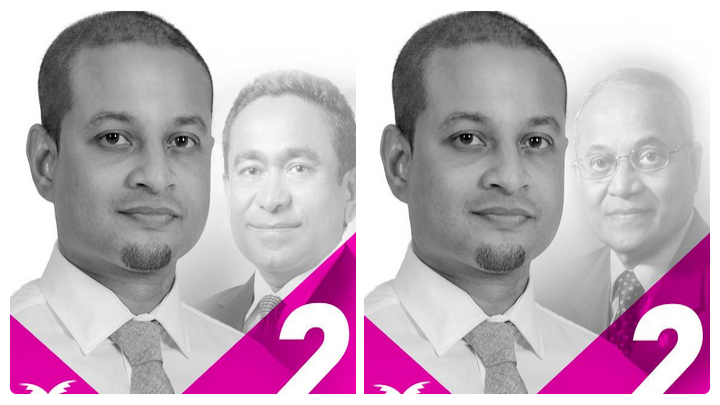 Several PPM MPs also snatched posters from MDP MPs and ripped some posters to pieces. Last night, the MDP and JP coalition revealed that the two parties have agreed to request a meeting with President Yameen to discuss 13 demands issued at last Friday’s mass demonstration. At a joint press conference, Ali Waheed said the parties would request an appointment today, adding that the 13 demands would be formally submitted in writing. Stop restricting fundamental constitutional rights and freedoms through amendments to either the constitution or laws. Release former President Mohamed Nasheed, former Defence Minister Mohamed Nazim, MDP MP Ali Azim and others arrested during anti-government protests. Withdraw political charges pressed against opposition politicians. Investigate alleged large scale corruption within the government. Continue providing the electricity subsidy and make electricity cheaper in Malé and other islands. Fulfil campaign pledges to provide subsidies to fishermen and farmers. Give back powers taken from local council, empower the councils, and enforce the Decentralisation Act. Enforce the Fiscal Responsibility Act. Increase wages for teachers, health workers and civil servants, ensuring equal pay to state employees. Reverse decision to impose import duty on fuel. Fulfil government pledges of providing unlimited health insurance. Ali Waheed added that the alliance would meet relevant state institutions to discuss specific demands. 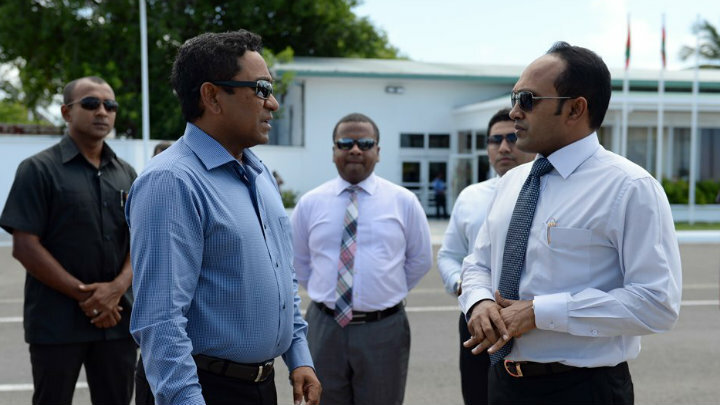 “Some of the demands are not just made to the President’s Office,” Waheed said.